Annex no. 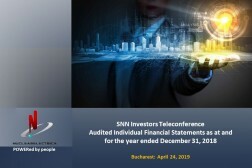 1 – Situation regarding the calculation of the level of the monthly gross fixed indemnity of the temporary members of the Board of Directors of S.N. NUCLEARELECTRICA S.A. Item 15: The approval of the mandate contract form which will be concluded with the provisional members of the Board of Directors. 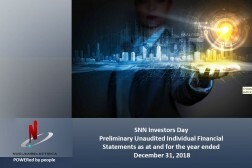 Punctul 17: The approval of the profile of the Board of Directors and the profile of the candidates for the positions of administrators of SN Nuclearelectrica SA. Item 19: . The approval of the ensured amount related to the professional liability for the administrators with mandate contracts and the limit of liability for the directors with mandate contracts as per the Note presented to the shareholders. Item 20: Information regarding the accomplishment of the requirements stated within the General Meeting of Shareholders dated 25 April 2018 regarding the clarification/resolution of the aspects highlighted by the independent financial auditor with regards to the individual and consolidated financial statements for the year 2017. Item 21: Information note on the transactions concluded with administrators, or directors, or employees, or shareholders having control over the company or a company controlled by them during 01.03.2018 – 01.05.2018, as per art. 52, paragraph (3) letter a) din of GED l09/2011 with subsequent amendments. Item 22: . Information note on the transactions concluded by SNN with another public company or with the public supervisory body if the transaction has a value, either individually or in a series of transactions, of at least the equivalent in lei of Euro 100.000, during 01.03.2018 – 01.05.2018, as per art. 52, paragraph (3) letter b) of GED 109/2011 with subsequent amendments.